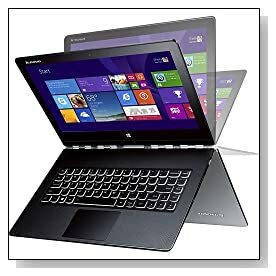 Lenovo Yoga 3 Pro is the new 13.3 inch QHD+ touch display convertible ultrabook and tablet with the Broadwell Intel Core M 5Y70 processor, large amounts of memory and storage in the form of Solid State Drive, backlit keyboard, faster 802.11ac wireless. You can use it in tablet, tent, stand and laptop modes comfortably and is suitable for general multimedia, office and more demanding applications. 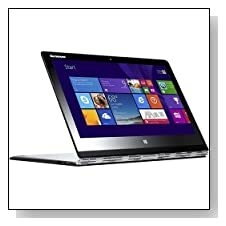 At first glance it has a fantastic design with a super thin body and 360-degree fold-back feature, screen is amazing, keyboard is very comfy, it looks perfect and wins in the looks department as well as the ease of use thanks to its superior design but let’s see how it performs and how it compares particularly to the Yoga Pro 2. Lenovo Yoga 3 Pro comes with the Sep 2014 release new dual core Intel M 5Y70 Broadwell processor (4MB L3 cache) with 1.1 GHz base speed and 2.60 GHz with turbo boost and hyper threading functions, 8 GB DDR3L SDRAM at 1600 MHz for all the multitasking you want, 256GB Solid State Drive as good amount of storage and overall fast performance and boot-ups and Windows 8.1 64-bit operating system. The M 5Y70 is an ultra-low voltage processor with a Thermal Design Power of only 4.5 watts which should contribute to longer battery life and thinner and lighter design as it can run with much less cooling and has the Passmark benchmark score of 2870 as of 16 Nov 2014. So you’re getting a good mix of performance, battery life and energy efficiency on paper. 13.3 inch QHD+ LED Glossy 10-point Multi-touch with a native 3200x1800 pixel resolution- better than standard Full HD offers amazing visuals even from extreme angles thanks to the IPS feature (great when you have a group of people viewing in tablet or other modes)- not as good as the image sharpness and quality of a 4K screen but pretty close. Graphics card is the new Intel HD 5300 and you should play the latest games of 2014 at lower settings and XGA, so don’t expect super gaming performance here as it will be limited by the TDP of 4.5W. So if the screen was perhaps just FHD rather than QHD+ the gaming performance could have been improved. You’ll hear immersive sound when you’re listening to music or watching videos with the Waves Audio and Premium JBL speakers. It also has a great quality webcam with built-in microphone for easy chats on Skype with friends and family. Lenovo Yoga Pro 3 is a winner in multimedia features department. Made from 813 individual pieces of aluminium and steel light silver colour Yoga 3 Pro weighs 2.6 pounds and is only half an inch thin making it super portable and has a uniquely beautiful design that allows it to flip around 360 degrees with its watchband-like hinge. It offers up to 9 hours of battery life on a single charge so you should be fine all day but in practice it is reported to be less in tests while working on a little demanding tasks, so the battery life is not really Yoga Pro 3’s strong point. The backlit keyboard is comfortable to type on (being a Lenovo) with keys that include the slight outward curve at the bottom but somewhat shallow- they don’t offer deeper travel as say a Macbook Air keyboard and the touchpad is clickpad style with two-finger gestures. Connectivity options on this super slim body include up to three times faster 802.11ac wireless, Bluetooth 4.0, a Micro-HDMI port, a headphone/microphone jack combo, 2 x USB 3.0 ports, 1 x USB 2.0 port and an SD card reader but obviously not an optical drive being such a super slim and light machine. Conclusion: Lenovo Yoga 3 Pro 80HE000HUS is a very light and ‘thinner than a pencil’ slim stable system with an innovative modern design, so there is not much to be said about its appearance and ease of use except that it is pretty much close to perfection. What we are not super impressed with is its overall performance under constant pressure, because of the super low TDP of 4.5 watts, so the focus here is more on energy efficiency than raw performance. Having said that it sure is more than adequate for office and multimedia tasks as well as 3D gaming at lower settings. The QHD+ touchscreen offers awesome picture quality and sound is really good too. Battery life is also not super impressive at this price level and this machine probably needs a larger capacity battery or updates of some sort. We like the comfortable backlit keyboard, faster AC wireless connection with wider coverage, thin and light design and quality of build and of course the amazing screen but not so much the battery life and overall performance could be better, after all the Yoga Pro 3 is not the cheapest hybrid machine out there- but still deserves the price as a great machine that it is and if you want more power for money you want to look at the Yoga 2 Pro with Intel i7-4500U.